There are numerous tourist attractions accessible from Dournazac, in the Haute Vienne. Situated in the Perigord-Limousin national park, in Richard the Lion Heart country, not far is the magnificent Château de Montbrun, Bulle d’R lists different activities that you may wish to do after your unusual night. Whether it is history or culture that interest you, or sporting ventures, you will find lots to do near Dournazac. 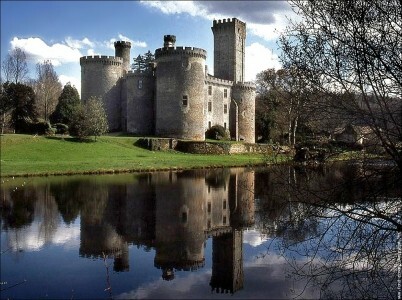 Explore the numerous castles of the Haute-Vienne and the museums. Visit Oradour-sur-Glane, the memorial village, approximately 35 minutes away from your bubble. Discover parcours in the trees, Velorail and the amazing zip-wire offered at L’Espace Hermeline. Relax in a swimming pool just 10 minutes away from your bubble, an ideal way to unwind. Enjoy romantic walks in this superb landscape with its many lakes. If you come at the end of October, you could collect mushrooms or visit the famous annual chestnut festival held here in Dournazac. Much is going on during the summer months. A market for food lovers is held every Monday throughout July and August in Bussière-Gallant. Numerous other markets are held in the surrounding villages throughout the week. The Tourist Office of the Haute-Vienne has a wealth of information on events and places of interest in the department. Nadine and Cédric can equally advise you during your stay. Many activities could complement your stay at Bulle d’R or extend your unusual night. Enjoy a quieter pace of life, and make the most of the quiet and solitude. Whilst we are to be found in the Haute Vienne department of the Limousin, the other regions of La Creuse and La Correze are to be explored. This region is green and lush, full of history and culture. By touring the Limousin you will not be disappointed with this beautiful landscape.